Cancer-ridden Jam Sebastian of Jamich critical? 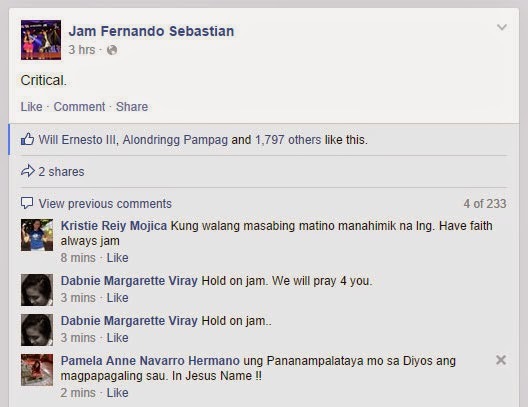 Home / news / showbiz / trending topic / Cancer-ridden Jam Sebastian of Jamich critical? 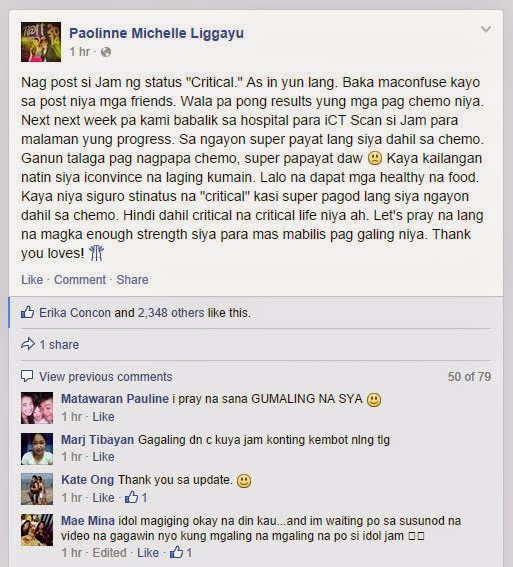 "Critical" was the attention-grabbing Facebook status message posted Thursday night by Jam Sebastian of the popular YouTube love team Jamich. It's public knowledge that the internet sensation has been diagnosed with stage-4 lung cancer in March and is currently undergoing chemotherapy for treatment. Whether or not it was literal, Jam's post quickly sent Jamich fans buzzing on social media. Coolbuster.net believes that Jam was referring to "critical" as an adjective which means "expressing adverse or disapproving comments or judgments."